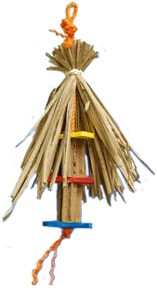 Strung on colored sisal rope with a body built of the smaller 1.5" x 2.75" honey comb Shred X, the added strips on top add to beak pleasing fun . There is loop is on top for easy hanging ... lots of chewing toy and texture with this shredable toy. Be sure to check out the original Shred X toys! Fun for those smaller to mid-sized beaks in your house!